While I was working with one of our water projects, I noticed a man wearing a cross necklace and approached him to enquire. During my initial exchange with the man, he shied away from me. After I had finished my work, he came over to me and asked why I was asking about the cross on his neck. I said usually people wear something like that as a reminder of Jesus. He then began to open up. Karam is from Homs, Syria. He’s 25, one year older than me. He was studying to be an architect when the war in Syria began to threaten his life. Most of his family has already left Syria, but his mother and father stayed because of the difficulty of the journey. Karam began to describe his life – and it sounded similar to how my life was in Canada. He was involved in his church community back home. His hope was to continue building the Kingdom through these ministry opportunities. The cross that Karam was wearing has a unique story. He couldn’t wear the cross around his neck while living in Syria for fear that he would be persecuted. 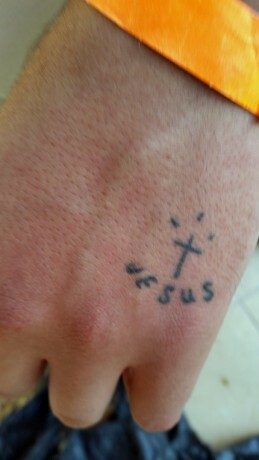 He had a cross and the name of Jesus tattooed on his hand as a reminder instead. He also told me about one of his friends who is traveling with him, Rana. She had to flee her home after Muslims began persecuting her family. Her home was destroyed, and her family ran. After what happened, she’s hesitant to trust anyone. Some of Karam and Rana’s other friends were kidnapped and are still missing.